The new Jupiter JEP1100 Compensating Euphonium is the result of years of research by the Jupiter design team along with a council of worldwide consultants. The goal was to create a superior quality instrument with impeccable intonation that responds well in all registers with great tonal warmth and brilliance. 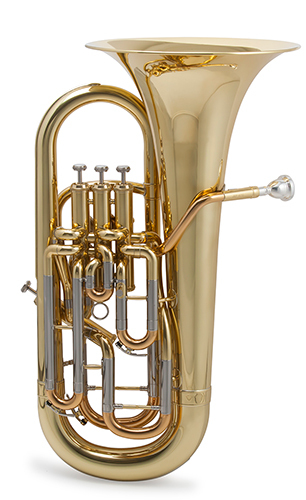 The Jupiter JEP112O euphonium features a specially designed 12.2” yellow brass bell and rose brass mouthpipe that utilizes a special manufacturing technique that ensures uniform thickness. Enhanced bracing is acoustically positioned throughout the instrument to increase tonal resonance, provide strength for better alignment, and offers greater durability. Double lapped stainless steel piston valves ensure improved action and agility. The end result is an instrument that produces a commanding tone with defined clarity perfect for the most demanding repertoire. “The tone quality is excellent with a full, resonant sound”, says Brandon Jones, XO and Jupiter euphonium artist. “The response is quick with incredible intonation and slots extremely easily throughout its entire range”.